Today's Draw: Temperance from the Barbara Walker's Tarot. When you have to make a choice, does it feel like it's always a matter of one thing or another? Or maybe it always comes down to a compromise? But is it possible there's a third option that holds the seed of both choices, and then some? 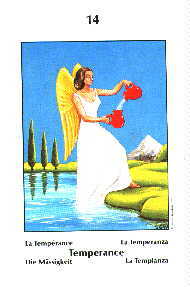 The Temperance card addresses the life lesson of walking the middle line, seeking balance in all things. It's interesting we got this card today, because this past weekend's card was about having a split mind about something or trying to satisfy two divergent opinions about something. I said if making a decision could wait, to pull back and try to see the situation from the bigger picture and just ruminate on it a little while longer. Well, Temperance comes to bring us a new idea about justifying opposing options. It's not necessarily compromise. It's not giving up your stake. It's something else. It's the third thing—the alchemy that occurs when Temperance pours one jug of water into another jug...the balance that occurs when she stands one foot in emotion and one in reason. Sometimes we become so focused on a choice between black and white that we don't see the third thing. If we can get past black and white, we usually think of a gray area of compromise. But the third thing isn't about gray. It's more about black and white stripes. Or black with a white swirl. I suppose an example would be the career choices I've made this year. For a long time I've wanted to be a spiritual writer, like a Dr. Wayne Dyer or Deepak Chopra—that kind of thing. I have a number of book ideas for that, but I'm a writer in my day-to-day career, too. I didn't feel like I could dive into a book that deep—my first book—in just my spare time. I could do it if I didn't write all day long to begin with, but when my day's over, I don't want to think that hard. So my options seemed to be to either quit my job (and income) to write a spiritual book. Or just continue on doing what I'm doing. I had a whole plan for the quit my job thing, and that was to sell my house and live off the equity, though that felt risky for me. Then the housing market went bad and I lost about half of the equity I had in my home. My plan was no longer as feasible. Meanwhile, I have a tarot hobby that I'm pretty passionate about. So, fast forward a couple of years and I come up with an idea for a tarot publishing project—more of an instructional book than something deep. On top of that, I get a chance to read professionally at local store, which exposes me to all sorts of struggles people are having. So while I now have three "jobs"—my normal writing job, my tarot reading and my tarot publishing project—I'm able to juggle this in ways it makes sense for me. On top of all of that, I'm now blogging every day and my blogs are a mix of tarot and spiritual inspiration. So here I am, I am first and foremost a freelance advertising copywriter, which is the career I've enjoyed for 25 years. I have a publishing contract. I'm a professional reader. And I'm blogging in a spiritual way. This isn't black or white or gray. It's black with a white swirl and maybe a little gray and blue mixed in, too. So it's not either/or. It's not a compromise. It's a third thing that combines elements of both the things I wanted, plus a third thing that acts as a bridge, of sorts. It will certainly be easier to write and publish my next book, whatever it is, with a track record behind me. And for all I know, maybe this is where I want to be. That hasn't revealed itself yet. But it's a better option all round than the two I had a couple of years ago when all I could see was black and white.